During pregnancy, it can seem like there’s an almost never-ending number of changes to your body. One of the most common is the development of a stripe that appears on your body – linea nigra. In this post, we take a look at what it is, what causes it, what can be done to prevent it and find out if it ever goes away. 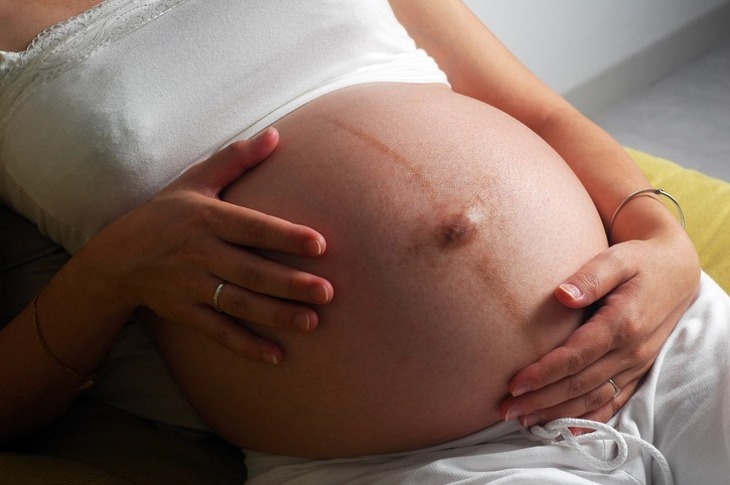 When Does Linea Nigra Appear During Pregnancy? Can I Prevent Linea Nigra? Does Linea Nigra Go Away After Pregnancy? Almost 75% of women will develop linea nigra during their pregnancy and thankfully, as it’s so common, we know quite a lot about it. Truth is you’ve always had this stripe going down your belly, it’s just you’ll never have noticed it before as it will have been the same colour as your natural pigment. Called linea alba (Latin for “white line”) the pigment will darken during pregnancy causing the darker line to be more visible. Typically, linea nigra is anywhere from a few millimetres to about a centimetre wide and runs vertically from your belly button down to your pubic bone. In some cases, linea nigra can actually continue past the navel to the upper abdomen or below the breasts. If you think about your abdominal muscles, the line is where the left and right side separate to accommodate your uterus which is one of the causes. While linea nigra is a completely normal and healthy thing to develop during pregnancy, many women do wonder what causes the line to appear. The truth is that it’s still a bit of a mystery. The most popular theory at the time of writing is that it’s caused by estrogen. As your body secretes estrogen, this stimulates skin cells called melanocytes which cause the pigment in your skin to darken. This is further supported as there a number of other skin pigmentation changes that can be experienced during pregnancy such as chloasma, also thought to be caused by estrogen. Thankfully though, these skin changes are completely normal and normally fade after a baby is born (though it can take a while depending on hormone levels). For the vast majority of women, linea nigra starts to become noticeable towards the end of the first trimester, however, it’s not uncommon for it to appear as late as the third trimester. According to the American Pregnancy Association, if you naturally have a darker skin pigment, it’s often more noticeable compared to those with lighter skin. Sadly, there’s not a lot that can be done to prevent the line from forming. Avoid The Sun The sun can play havoc with your skin and cause the linea nigra to worsen. If you have to be outside aim to stay in the shade, use sunscreen and cover up as best you can. Lemon Juice Maybe this is an old wives tale but some women report using a squeeze of lemon juice on their skin can help the pigment fade back to the normal shade. Diet Research is beginning to suggest that pigmentation discoloration can be partly down to a folic acid deficiency. A healthy diet combined with proper pregnancy multivitamins could potentially prevent the line from becoming more pronounced. Lotion We’ve also had recommendations that a good lotion on your belly can help. It wont remove the line but it will help with any itching that you may be experiencing. Whatever you do, make sure that you never apply a skin bleaching cream to your linea nigra. Hydroquinone (a common chemical used in skin bleaching creams) has not been approved for use during pregnancy or breastfeeding. Not only have these creams not been approved to use, but they’ve also been linked to skin cancer and birth defects. The good news is that after you give birth the linea nigra will go away. While this won’t happen overnight, it will start to fade as the weeks and months pass. Depending on your levels of estrogen and if you’re breastfeeding, this may take a little longer to go as your hormones will be higher causing the pigmentation to fade slower. While rare, there are instances when the line on your belly won’t fade away. If a line has started to appear on your tummy, don’t worry – you’re certainly not alone! With up to 75% of women developing linea nigra during their pregnancy, the condition is extremely common and harmless to both you and baby.